Ten-man Rob Roy failed to trouble a competent Irvine Meadow side that ran out comfortable 2-0 winners at Guy’s Meadow on Saturday. The game was preceded with a minute’s applause for legendary Rabs’ player Joe Fascione, whose brother Vinnie helped with the coin tossing proceedings. The first chance fell to the home side when Cameron Clark’s sixth minute free-kick from out on the left skidded on the wet turf and went wide of keeper Shaun Newman’s left hand post. Then a 30-yard shot from new signing Scott Forrester landed on the top of the Meadow net before Joe Slattery’s deflected effort drifted in to the side netting. In the 21st minute Irvine should have taken the lead when, from a Ben Carson cross, Reece Pearson headed over the bar from six yards out. However six minutes later Meadow did make the breakthrough when Rhys Devlin sent a powerful header from a James Latta free kick beyond Rabs keeper Craig Gordon. Playing with a strong wind behind their backs, Rob Roy were unable to take advantage of the elements with many intended passes going astray. Nevertheless in the 37th minute Gavin Mackie’s free-kick was headed towards goal and cleared off the goal line. Rabs suffered an injury blow minutes later when Alberto Vezza was injured in a robust tackle and after treatment was replaced by Gary Carroll. 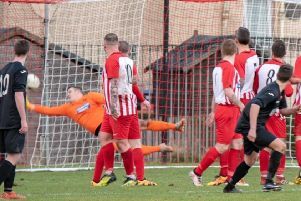 On the stroke of half-time Lee Gallacher sent over a free kick from the edge of the penalty box and the ball was spilled by keeper Newman but Martin McBride was unable to capitalise on the error. After the break, and now playing with the strong wind advantage, Meadow pushed forward to increase their lead and in the 52nd minute they did just that. Roddy Paterson sent over a low cross in to the Roy’s penalty box and in a ruck of players Brendan Sharpe was first to react and swept the ball past Gordon. A minute later Rabs’ Michael Daly was booked for dissent and then followed this up with a second yellow for foul play in a frantic four-minute spell. Keeper Gordon then made a super save, tipping over a Carson free-kick, and Colin Spence went close when his header went over the bar as Meadow took advantage. In a rare Rabs venture up field Gallacher drove the ball over the bar and then, at the other end, Gordon made a fine save with his feet to prevent Irvine from increasing their tally. In the final 15 minutes Meadow were content to keep possession against a lacklustre Rabs attack, which rarely troubled keeper Newman. It was no surprise therefore that the game petered out in favour of the visitors who thoroughly deserved the three points. 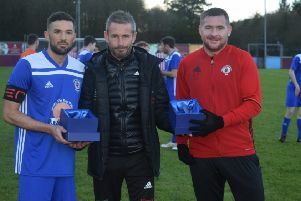 Sponsor Charlie O’Brien presented the Supporters’ Man of the Match trophy, kindly donated by Roddy the Dog Walker, at the end of the game to Joe Slattery.